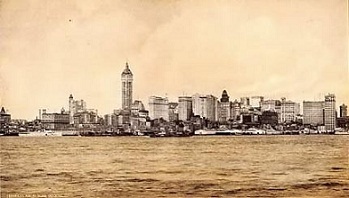 One of the many black families settling in New York at the turn of the 20th century was the Waller family. In their quest to guarantee a better future for their children, they left their native Virginia for the big city. They had eleven children between the years of 1890 to 1920, of whom only five survived. Thomas Wright Waller was born on May 21, 1904. He was a turbulent and restless boy. He loved music from a very early age on. His parents took him to church where he had the opportunity to listen to religious hymns and to the organ of which he remained particularly attached for the rest of his life. His father, Edward Martin Waller, was pastor of the Abyssinian Baptist Church in Harlem. Around the age of six, he occasionally climbed up the stairs to his neighbour’s apartment so that he could play their piano. He was fascinated by the instrument and openly expressed his desire to become a pianist. Very shortly after, a piano appeared in the Waller apartment. Encouraged by his mother, Thomas took several lessons from a certain Miss Perry. He often played “by ear” because he found the music boring. He also practiced on the church organ and He soon joined the school orchestra where he claimed his first success; making his classmates laugh. 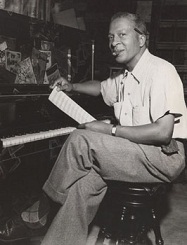 His father, wanting him to become a Pastor like himself, took him to see the pianist Paderewski, in concert, but "Fats", as his friends called him because of his stoutness, preferred the ragtime of Tom Turpin and Scott Joplin or the "stride piano" being heard in jazz clubs. Subsequently, Fats became acquainted with a Miss Maizie Mullins, the organist at Harlem's Lincoln Theater, and dreamt of replacing her. She trained him and by 1919, Fats became the regular organist there, accompanying silent films to the delight of the audience. Two years later, he also became organist of Harlem's premiere Lafayette Theater for $50 a week. At seventeen, he married Edith Hatchett and had a son, Thomas Jr. In 1920, his beloved motherdied and soon after that, he left the family after an argument with his father. He was taken in by pianist Russel Brook's family. Brooks had a player piano and numerous rolls by Luckey Roberts and James P. Johnson. Fats was in a hurry to learn these hits by heart, so he would place his fingers on the keys while the piano played automatically. Fats divorced Edith in 1923 and was plagued by her persistent alimony claims for the rest of his life. In 1926 married Anita Rutherford. They had two sons Maurice and Ronald. It was during this period that Fats slowly built his life's dream. He met the piano celebrities Willie Smith and James P. Johnson who both gave him solid training in the art of stride. He practiced piano more and more and hung around the clubs in Harlem at night. He never missed an opportunity to slide under the keyboard when the musicians took a break. His dynamic and humorous character propelled him into the musical meetings and rent-parties taking place in Harlem. Fats probably made his first recording in 1922, thanks to the intervention of Clarence Williams who also encouraged him to compose. He first recorded Muscle Shoals Blues, followed by Birmingham Blues, which he spontaneously wrote while in the studio. He was very much at ease with recording, and his astonishing tune-writing qualities were revealed in the first session. Their first song published was Wild Cat Blues. IIn that year, he accompanied beginning blues singer Sarah Martin, and continued to make recordings. In 1923, he collaborated with J. Lawrence Cook to create player-piano rolls for the QRS company (Quality Reigns Supreme) of Buffalo, NY. Piano rolls were quite popular at that time. The manufacturing process consisted of transcribing an imprint of each note onto a master roll. After corrections and additions, a technician would then perforate the imprints. The rolls were then mass produced. 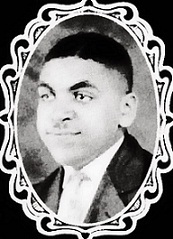 In 1927, Fats Waller met the talented poet and lyricist Andy Razaf. They co-authored a number of successes together. The tiniest melody inspired words for a song. The tandem regularly submitted their compositions to music publishers. Relationships with the publishers were stormy. As a general rule, they would try to buy the rights to the song for next to nothing, or they would "forget" to pay the royalties. In reaction to these practices, Waller and Razaf would either leave the office in an outrage and rip up their creation, or accept the pathetic sum offered by the publisher and afterwards submit the same song to a second, and then a third publisher. Selling their compositions in this manner allowed them to have a decent income. Fats was frequently victim of his own happy-go-lucky attitude, and his total lack of organization in his business dealings. Occasionally, he sold his compositions for next to nothing ; compositions which were to become huge hits only shortly thereafter. This was the case for the songs, On the Sunny Side of the Street, I Can Give You Anything but Love, and If I Had You which, according to musicians and close relation were most likely his compositions. 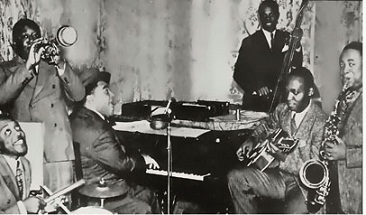 Fats went to Paris in 1931 and played in several clubs. He then returned to New York and was discovered in 1934 by RCA Victor recording executives at a party given by Georges Gershwin. He began an intensive series of recording sessions with RCA Victor and began hosting a weekly radio show, performing in public and becoming an immensely successful and popular performer and recording artist. 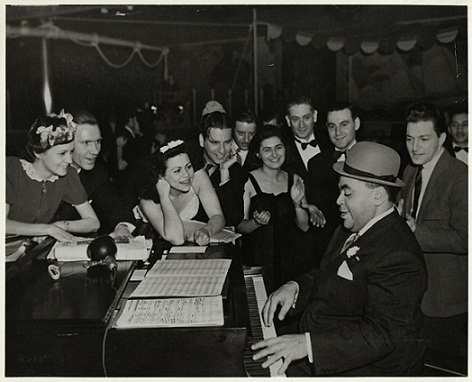 Fats made his first recording on May 16, 1934 with a small group called "FATS WALLER and his Rhythm". He rarely performed without this group. They played together without respite for 9 years, recording more than 400 songs, playing for radio shows, and appearing in movies. Fats directed the orchestra with his eternal good humour. His presence and energy empowered each performance. He knew how to encourage each musician to give the best of himself, all of this, with either a single word, a joke or a chorus on the piano. All remained spontaneous with arrangements and rehearsals being reduced to a strict minimum, as usual. Fats WALLER became a big star, drove around in a Lincoln, and wore tailor-made suits. Each of his performances triggered off applause and laughter because of his hilarious antics. You should have seen this big man dancing around, and then shaking his bottom at the audience before beginning his song once again with changed lyrics. He emptied the bottle of gin beside his piano every night. Fats was happy…well, almost. He still dreamed of playing in prestigious concert halls for the same public that rushed to hear George Gershwin, or any other classical concert. He suffered from not being recognized for his qualities as a pianist, and sometimes grew tired of his “jokester” image. He consoled himself by drowning himself in activities, washing them down with gin or Old Grand Dad, his favourite bourbon. In 1943, Hollywood produced the film Stormy Weather in which he appeared along with Lena Horne and Bojangles Robinson. The last Broadway show he composed for was Early to Bed. Once again, it was a hit.A train returning to Los Angeles carried one exhausted Fats WALLER. His last engagement at the Zanzibar Club had to be interrupted because of a bad case of influenza. On the night of December 15, 1943, the train was immobilized in the Kansas City train station because of a blizzard and icy winds. Fats sat shivering and unconscious in his compartment. He was declared dead in the wee hours of the morning by his manager, Ed Kirkeby, and a doctor who had been called in emergency. What stupor ! At the age of 39, Fats had closed his eyes for ever.